Evil Genius recently started pinging on my ‘foodie’ radar. Business colleagues mentioned it in passing; I read a fantastic review in the last few weeks too. However, you know a restaurant is good, when it’s talked about in ‘smiley’ whispers; if diners are willing to share, but only with a select group of friends – them’s the places you want to head to. This happened recently at my yoga class, with our backs to the mats, in contemplation of a hot bendy class, a pair of yogis risked the peaceful wrath of our instructor and just before the first downward dog, whispered the legend of the ‘soft as a cloud bao roll with the bulgogi beef’ and with an outward breath I heard, ‘Evil Genius’ ‘PING’ I was sold. So my sons and I confidently (some would say smugly without booking) jumped in the car and drove up to Ferrymead in order to meet these legends, only to find a queue outside and no tables available (arse). So first lesson, chuck out the ‘smug’, pick up the phone and make sure you book – which we did for the following week! “A place to Zig when everyone else is Zagging” boasts their website. Where On The Street : 1091 Ferry Road, Ferrymead (look out of the giant sign). Because of the fabulous feeling, gracious welcome and funky eclectic vibe, this place is the perfect spot for a first date (last date too actually), group of mates, mother and sons beersies catch up or if like me you like to dine alone – ding! dong! Tucked away, but right on the estuary, overlooking the water the drive is gorgeous. If you’re heading from Linwood, or straight through town it’s just before the bridge taking you into Redcliffs proper. It has an outdoor area for Summer dining and open bar / tiny weeny kitchen for vital viewing. Close intimate and full of character, a warm friendly place, not so much evil but definitely genius. Beck greeted us with an authentic smile, it’s the place that subliminally invites you to shrug off your coat and into the atmosphere so your night can begin. 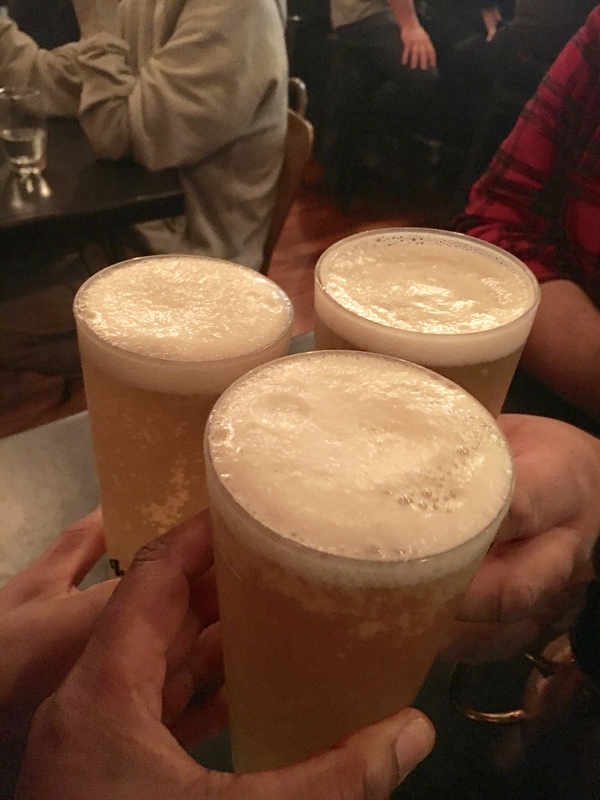 3 Pints of Evil Genius IPA – Cheers! Foodage : Evil Genius is a cheeky, modern, funky Asian-fusion tapas bar, with an excellent menu, loads of personality, stocked with tasty morsels to tantalize and keep you engaged. I love an establishment, you want to return to, solely on the warmth of the staff and the promise everything, on the menu, which even on paper, makes your mouth water. 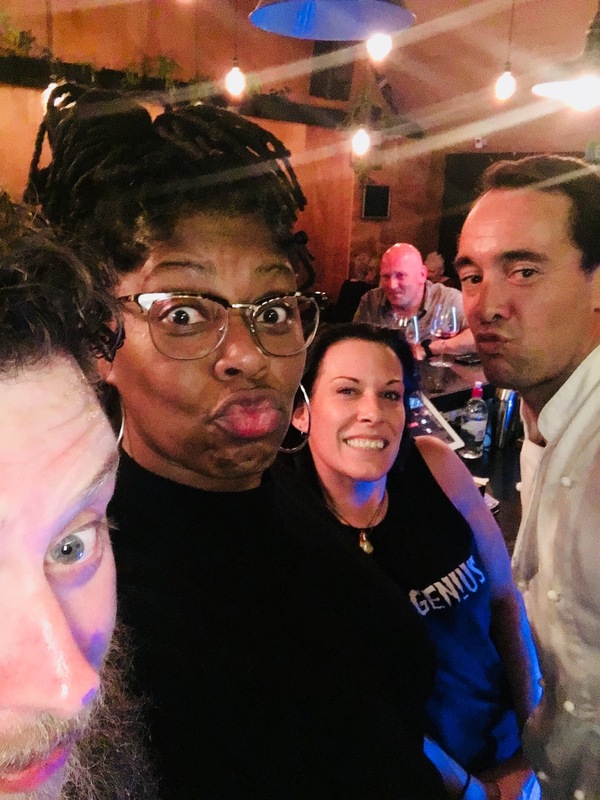 MONDAYS: at Evil Genius is menu free : ‘No Menu Monday’, basically you trust the chef, so I took the best critics I know, my son’s Jack and Tom and we travelled East with our bellies in wheelbarrows. The Monday gig, is a shared, tasting affair of 3 courses. First course, a plate of Asian slaw, to open the taste buds and get the juices flowing. 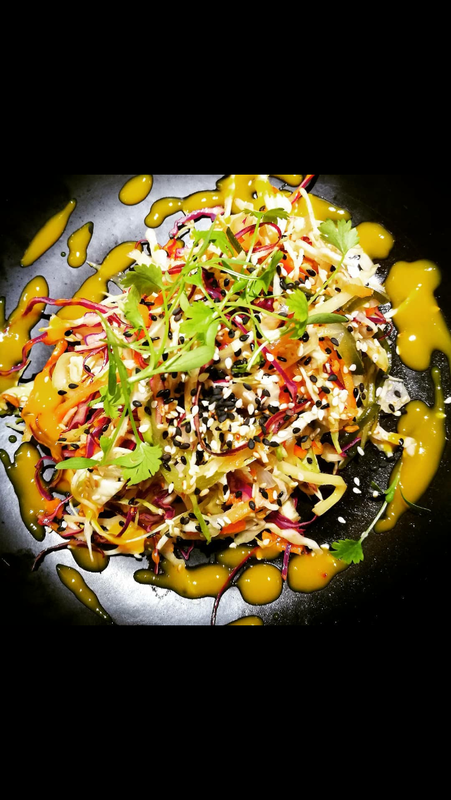 This gorgeous tangy dish offered, amongst the finely sliced fresh vegetables, Chinese cabbage, coriander, shredded bamboo shoots, lychees, black sesame seeds, dressed with a coriander chimichurri and coconut cream dressing. Perfectly balanced, with just enough heat and tang hit to engage the palate. Once we cleaned up, the next shared plate, of course, the light as a feather bao buns with bulgogi beef. Tom, is gluten free, so his dish arrived, as tightly wrapped rice paper rolls (nice touch). Both dishes : tender sticky beef, with Asian slaw, rendang mayo and a crunch of daikon pickle. All wrapped up in the light as a feather bao bun. I could have eaten 10 of those babies to be honest. “The hype is real” from my son Jack, once he’d licked his fingers and “top notch” from Tom, he of a few words. If you like to dwell on your choices, then Evil Genius has a full menu from which to ponder. Tapas, brunch a smattering of desserts that won’t leave you disappointed. Top dollar, you’re looking at around $18.00 for a breakfast dish of Apocalypse Bao : Crispy Bacon, Fried Egg, Buttered Kimchi, Kaffir Lime Hollandaise all on a bao bun, or tapas range from $9 to $16 a plate. Quenching your thirst is not a problem either with a bunch of goodies: on tap, including Evil Genius IPA, bottled beers and cider, a fabulous wine selection and of course a bespoke cocktail menu. 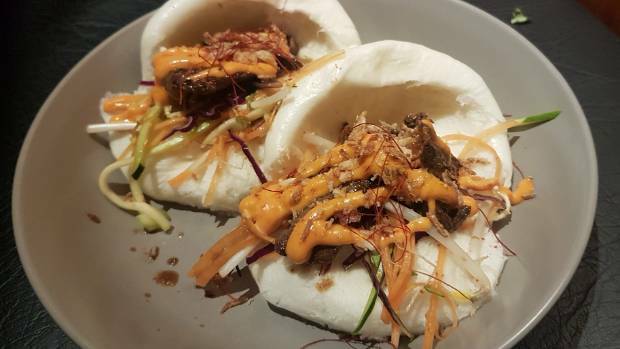 WORD Street Eats : Evil Genius – Bao Buns : It’s not always about the price, or the Michelin star, but the ‘word’ on the Street; what are people saying, often the only accolade a place with a good idea, plenty of passion and fabulous food needs. In my lifetime, I’ve had the best food in some of the worst looking places, old buses, wooden shacks, barrows made from bicycles and crates. …. but ultimately, I’m there for the food. These eateries often created so food can be shared and if a person can be bothered to go to so much trouble, then you know the love will be the first ingredient in the pan. If you consider your mother’s kitchen, well, I’ll consider mine. Her kitchen is ramshackle, tuned in to her own ‘kitchen dance and grace’ she knows where to put her hands on everything she needs, even though it looks like a colourful, schizophrenic mish mash of kitchen appliances, surrounding the oldest, cleanest gas cooker in Brixton!!! What I’m trying to say is love can arrive in many different kinds of packages, put your instinct first and you won’t be disappointed. Beck, Evil, Genius and I! For more reviews, views, Hax, tips, tricks, tips, plus of course, banging recipes from Jax, head to www.jaxfoodhax.com or www.jaxhamilton.co.nz.